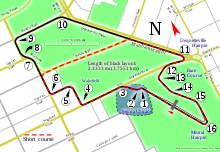 The 1988 Australian Grand Prix was a Formula One motor race held at the Adelaide Street Circuit, Adelaide, on 13 November 1988. It was the 53rd Australian Grand Prix to be held since the original 100 Miles Road Race was held in 1928, and it was the fourth race to be held on the streets of Adelaide as part of the Formula One world championship. It was the sixteenth and final race of the 1988 Formula One season, as well as the last race for which turbocharged engines would be eligible until 2014. The race was won by French driver Alain Prost driving a McLaren MP4/4. It was the third and final time Prost won the Australian Grand Prix after winning the race in 1982 (a non-championship Australian domestic series race) and 1986. Prost's 36 second win over his Brazilian teammate Ayrton Senna was McLaren's 15th race victory for the season, a new record for a constructor in a single season and Prost's seventh win for the season. It was also McLaren's tenth 1–2 finish of the season, yet another record. Outgoing World Champion Nelson Piquet finished in third place driving his Lotus 100T, allowing Honda powered cars to clean sweep the podium in the final race of the original turbo era. It was Team Lotus' 172nd and final podium finish in Formula One, and the last time Piquet would step on the podium until finishing second in the 1990 Canadian Grand Prix. As had become normal in 1988, qualifying was the domain of the McLaren-Hondas. Senna and Prost easily led the time sheets on both Friday and Saturday, with Prost initially fastest on Friday with a 1:18.179 lap, 0.153 ahead of his teammate. The pair traded pole laps in the second qualifying session, with Senna doing his usual act of snatching pole on the last lap of qualifying with a 1:17.748 lap, only 0.132 in front of his teammate, but 1.7 seconds faster than the next fastest car, Nigel Mansell in the Williams-Judd. During qualifying Senna was hampered by a sprained left wrist having injured it during a game of beach soccer in Bali where he had taken a small holiday after winning the championship in Japan. His injury was such that there was speculation the teams test driver Emanuele Pirro would drive in his place, but the new World Champion refused to be sidelined and took his place in Adelaide, though he admitted that driving the MP4/4 on a tight, bumpy street circuit while nursing a sprained wrist was hard. Prost on the other hand had spent his time between Suzuka and Adelaide playing golf at a resort in the Australian state of Queensland. There was also speculation that Honda would run their V10 engines (intended for 1989) in Adelaide instead of the V6 turbo. However, team boss Ron Dennis explained that racing the V10 was never part of the 1988 plan, and that with the RA168-E proving so dominant, Honda wanted to finish the turbo era on the highest possible note. Third on the grid on both days was Nigel Mansell in his atmospheric Williams-Judd, though he was 1.7 seconds slower than Senna. Mansell was ahead of 1987 pole winner Gerhard Berger in his turbocharged Ferrari. Fifth was Nelson Piquet, finally finding some balance in his Lotus on the only street circuit he liked, despite a couple of spins in qualifying. Mansell's teammate Riccardo Patrese lined up sixth. Gabriele Tarquini (Coloni), Julian Bailey (Tyrrell), Pierre-Henri Raphanel (Larrousse-Lola making his first appearance in F1 in place of Yannick Dalmas who had contracted Legionaire's Disease) and Bernd Schneider (Zakspeed) all failed to qualify. The Osella of Nicola Larini with its ancient "Osella V8" turbocharged engine (which started life as the Alfa Romeo 890T in 1983 and was actually the most powerful car in the 1988 field with approximately 700 bhp (522 kW; 710 PS)) failed to pre-qualify. For the most part in 1988, qualifying and race times had generally been faster than those set in 1987, showing the advances in development despite the leading turbo powered cars having approximately 300 bhp (224 kW; 304 PS) less than they had the previous year. In Adelaide the drop in power meant a big difference to the top speeds on the 900-metre-long Brabham Straight and times were slower as a result. In 1987 the faster cars were topping 320 km/h (199 mph) on the straight, while in 1988 those speeds were down to 300 km/h (186 mph) or less. Senna's 1988 pole time was 0.481 slower than Berger's time in 1987 while Berger himself, driving an updated version of his 1987 Ferrari, was 2.25 seconds slower than his 1987 pole time of 1:17.267. Prost led off the start from Senna, Berger (who planned to go out in a blaze of glory, and despite knowing it would cause him to run out of fuel well before the finish, had his turbo boost turned up its full 2.5 Bar limit), Piquet, and Mansell in his last race for Williams before joining Ferrari in 1989. By lap 4 Prost's lead over the World Champion elect had grown to 5.5 seconds, with Berger crawling all over the back of Senna's McLaren which was already having gearbox trouble. Michele Alboreto's last race for Ferrari ended in retirement shortly after the start after being hit by Alex Caffi's Dallara-Ford Cosworth. Alboreto, who had trouble in qualifying with a down on power engine and could only manage 12th on the grid, had the same plan as Berger but never got the chance to execute it, retiring just a few hundred metres from the start line. For the last race of the turbos, Ferrari apparently went along with its drivers plans with the belief that regardless of fuel issues, it was better to go out in the lead rather than plugging along in the wake of the McLarens. Berger passed Senna on lap 5 at the Racetrack Hairpin, a tight second-gear right hander at the end of the Brabham Straight, and began a determined drive, catching and passing Prost at the same place on lap 14. By lap 23 he had a three-second lead before coming up to lap the Eurobrun-Ford Cosworth of Stefano Modena and the Ligier-Judd of notorious blocker René Arnoux. True to form, Arnoux seemingly ignored the flags and his mirrors telling him he was about to be lapped and turned into the hairpin, causing the Ferrari's left front wheel to ride the rear right wheel of the Ligier and send both cars into a spin. Both cars stopped in the middle of the corner, with the Ligier having stalled and the Ferrari unable to continue with suspension damage. All this handed Arnoux's ex-Renault teammate a lead he would not lose as he cruised past just a few seconds later. Many, such as BBC commentators Murray Walker and 1976 World Champion James Hunt, blamed Arnoux for taking Berger out of the race, but the Austrian explained in a television interview with Barry Sheene after he'd returned to the pits that his hard early charge had left him with a "long brake pedal" and that he simply didn't have the stopping power to pull up before Arnoux turned into the corner. Sheene also interviewed Arnoux a few minutes later and the Frenchman expressed regret for having taken Berger out of the race, but also admitted that he had not actually seen the Ferrari as it had been behind the EuroBrun down the straight, though most chose to believe that it confirmed that the Frenchman, the oldest driver in Formula One at the time (he was 40), rarely used his mirrors. This left the McLarens in their usual 1–2 position, although Senna's faulty gearbox was getting progressively worse as the race wore on. Piquet was maintaining third ahead of the Williams pair of Patrese and Mansell (the Englishman made a good start and looked like being third into the chicane, but was muscled out of it by Berger's Ferrari with its turbo boost off the clock. He was then passed by Piquet using superior Honda power on Brabham Straight, while Patrese then drafted him past the pits and out braked him going into the chicane at the start of lap 2). The Italian opened a small gap on his teammate and closed on Piquet, making several attempts to pass his former Brabham teammate, but was hampered by his Judd V8's lack of power on the straights compared to the turbocharged Honda V6 in the Lotus (according to Mansell at the end of qualifying, the Williams-Judd's were around 15 km/h (9 mph) slower on the straight than the turbos). Patrese would often be all over the Lotus through the tighter sections of the circuit, but once onto the straights Piquet put enough distance between them that they were not close enough to pass under braking. The Williams teammates were also hampered by Piquet finally having his Lotus handle to his liking and the race being run on the only street circuit he actually liked. Though despite this, in the first half of the race Piquet was still lapping over a second a lap slower than Prost (and Berger), and around half a second slower than Senna. On lap 53 Patrese spun at turn 13, letting Mansell past, but he was equally unsuccessful in passing his former teammate and 13 laps later retired when his brakes failed and he hit the wall on lap 66, also at turn 13 (Mansell had said in a television interview during qualifying (aired on the BBC as part of their pre-race "Pit Bits" segment) that the team had shot itself in the foot for the race by having major brake trouble at a track notoriously hard on brakes. The team was predicting that both cars would run out of brakes well before the end). By lap 59 Prost was putting in a succession of fast laps, gaining a lead of over 30 seconds and lapping the whole field up to 5th placed Andrea de Cesaris' Rial-Ford Cosworth who had started 15th and was putting in his best drive in a long time. Many in the press and in the F1 paddock were puzzled by de Cesaris's driving. The wide open spaces of Suzuka in Japan had not been wide enough for the crash-prone Italian, yet here on a tight street circuit surrounded by concrete walls he was driving his best race since finishing 3rd in Belgium almost 18 months earlier with no sign of crashing. The circuit's demanding nature was obvious: The Minardi-Ford Cosworth of Pierluigi Martini spun out of the chicane on lap 46 and was almost collected by the Ligier-Judd of Stefan Johansson. Maurício Gugelmin (March-Judd) slowed to avoid the pair and was hit from behind by the Lotus-Honda of Satoru Nakajima who had just come out of the pits on new tyres and couldn't stop in time. Both cars were out on the spot with the front of the Lotus looking very second hand, though both drivers were unhurt. This crash also had an effect on Prost who was the first car upon the scene. The McLaren ran over some debris which broke off part of the front end wing plate, causing the car to understeer for the rest of the race, though Prost was able to play with his cars onboard settings to compensate and would set the fastest race lap later in the race. Prost's fastest lap of 1:21.216 was exactly 8/10ths slower than Gerhard Berger's fastest lap (1:20.416) in 1987. Alessandro Nannini spun his Benetton-Ford, Jonathan Palmer (Tyrrell-Ford Cosworth) retired with transmission problems, whilst engine problems claimed Arrows teammates Derek Warwick and Eddie Cheever. Driveshaft failures accounted for the EuroBruns of Stefano Modena and Oscar Larrauri (Modena, who had stalled his car at the start of the parade lap and had to start from the back of the grid, had two spins). Alex Caffi succumbed to clutch failure in his Dallara, and Philippe Alliot (LarrousseLola-Ford Cosworth) surprisingly ran out of fuel. At the finish, only eleven cars were classified, of which just seven reached the chequered flag, with three cars running out of fuel in the closing laps and Philippe Streiff having an electrical failure in his AGS-Ford Cosworth in the last nine laps. Prost led home Senna in yet another McLaren 1–2, Piquet claimed third and Patrese fourth. De Cesaris' Rial – which had the smallest fuel tank in the field – ran dry just four laps from home, handing fifth place to Thierry Boutsen (Benetton) despite a spin and a stuttering engine, whilst Ivan Capelli (March) came home sixth despite a puncture. This was the last race in which turbocharged cars and fittingly, the podium was filled by turbo powered cars. Turbocharging, which had been introduced to Formula One by Equipe Renault in 1977, was banned after 1988 allowing only normally aspirated engines to race, mostly due to increasing concerns in safety regarding the speeds the cars were reaching with 350 km/h (217 mph) plus seen in 1986 and 1987, as well as the cost involved with companies like Honda and Ferrari spending countless millions on R&D for their cars and engines. Banning the turbos, which was pushed through by Fédération Internationale du Sport Automobile boss Jean-Marie Balestre, was the governing body's attempt at reducing costs and speed in F1 (ironically the new atmospheric cars would actually prove faster overall from 1989. Although top speeds would be well down for a few years, other advances such as aerodynamics, tyres, active suspension and semi-automatic transmissions, plus much better throttle response, saw overall lap speeds actually increase). After 25 years, Turbos made their long-awaited return to Formula One in 2014, ironically at the Australian Grand Prix in Melbourne. There was also some criticism of the scoring system. Prost scored 105 points during the season and finished first (7 times) or second (7 times) in each of the 14 races he completed. However, Senna won the World Championship scoring only 94 points, including a fourth and a sixth but had won 8 races to Prost's 7. This was because of the "discard rule", which counted only the best eleven results of the year toward the Championship total; this meant that Prost ended the season with 87 and Senna with 90, the system would not change until 1991. Senna become only the second champion after John Surtees in 1964 to win the Championship without having scored the largest number of points (in that year Surtees scored 40 points and won by a single point from Graham Hill who earned 41, but had to drop 2 from his worst finish, a 5th in Belgium). Note: Only the top five positions are included for both sets of standings. Drivers could only count their best 11 results; numbers without parentheses are Championship points; numbers in parentheses are total points scored. Points accurate at final declaration of results. The Benettons were subsequently disqualified from the Belgian Grand Prix and their points reallocated. ^ "1988 Australian Grand Prix". formula1.com. Archived from the original on 18 January 2015. Retrieved 23 December 2015. ^ a b "Australia 1988 - Championship • STATS F1". www.statsf1.com. Retrieved 6 March 2019. This page was last edited on 12 April 2019, at 04:34 (UTC).